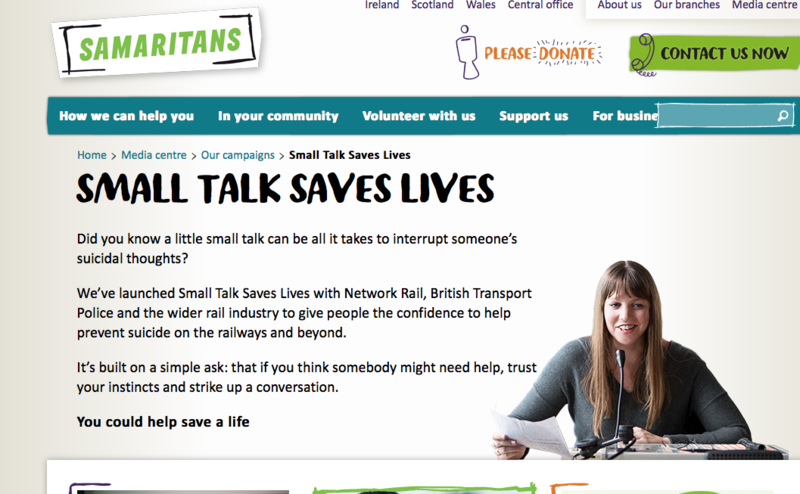 The Samaritans’ new campaign, Small Talk Saves Lives, aims to give ordinary people the confidence to approach and chat to anyone they may think is contemplating suicide at train stations. We spoke to Dr Lisa Marzano, lead psychologist behind the campaign, who works with the Samaritans Media Advisory Team, and previously British Transport Police, on training staff in helping suicidal people. A 2016 systematic review of rail suicides by Brian Mishara and Cécile Bardon, commissioned by Samaritans, revealed there was little information about why people choose to die by suicide on the railways and, importantly, what might reverse this decision. Marzano (Middlesex University London), along with colleagues from her own university and the University of Westminster, were selected by Samaritans and Network Rail to develop five studies to explore this question. These included an online survey, face-to-face interviews, the assessment of CCTV footage of railway suicides, an analysis of news reports and an exploration of what information is available to those searching online about suicide on the railways. Marzano said the research and resulting campaign were relevant beyond suicides on the UK rail network: ‘I hope it helps us to open up more conversations about suicide and more opportunities around it. I hope we begin to recognise that suicidal thoughts are very common but there’s recovery from them, and there are things we can all do to help’. The Small Talk Saves Lives campaign reached more than 10 million people in its first 15 days and was endorsed by Stephen Fry, Lord Alan Sugar, suicide researcher Professor Rory O’Connor and many others. - To find out more about the campaign see www.samaritans.org and to contact Samaritans for support call 116 123 (UK and Ireland). Find many more resources in our archive.